Action Comics #1003 came out this week and continued to be a tremendous read, my favorite of the Bendis Superman titles. Bristling with Metropolis activity and heavy on character interaction, it is this book which makes me think Bendis has a great handle on Superman and his supporting cast. 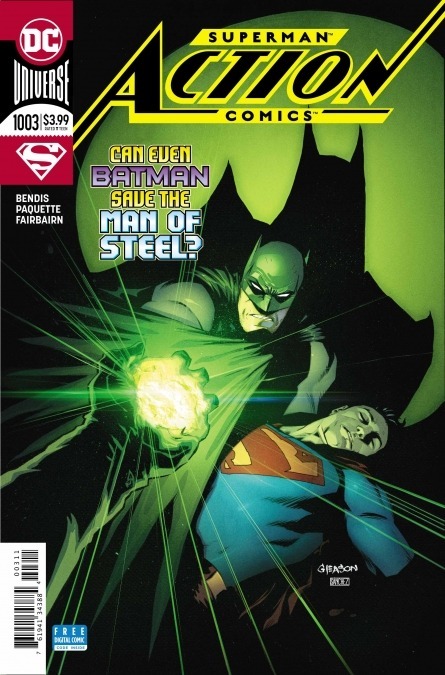 As is usual for this book, the Daily Planet pit and the staff play a big role in this issue. From Perry to Robinson Goode to Jimmy to Clark to the revelation that Lois is back, all the Planet scenes just sizzle. And knowing that Robinson Goode is a plant just revs up the suspense. Not that the plot doesn't progress. The Red Cloud mystery continues with one suspect now eliminated. The Invisible Mafia mystery continues to swirl. And even the unknown origin of Goode gets a couple of hints added to the mix. But the biggest joy was the interaction with guest star Batman. Two simple words made me smile! The art on the book is done by one of my personal favorites, Yanick Paquette. One thing I love about Paquette's work is that the page layout and panels are a big a part of the story-telling as his expressive and detailed art. His pages in Wonder Woman Earth One sing in this manner. And here, we get that same strength. Just incredible. All in all, this was a wonderful issue to start this somewhat troubling week of comic reading. On to the book. 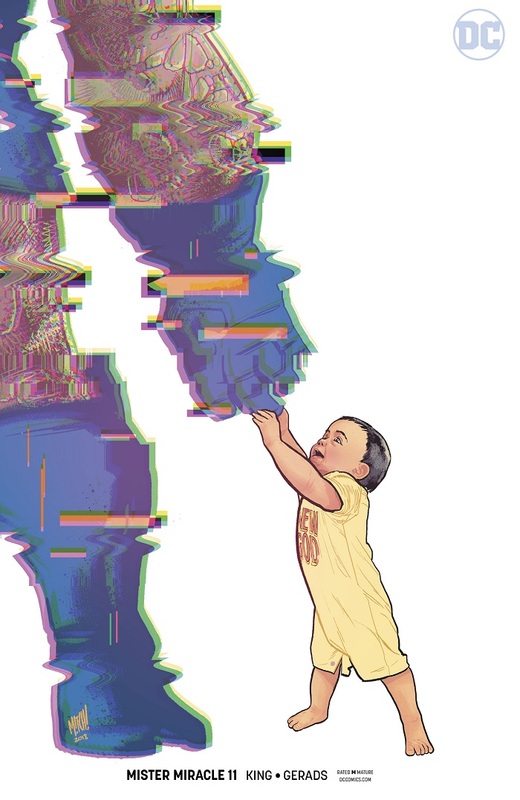 It's been a week since Mister Miracle #11 hit the stands and so my hope is I am near the spoiler event horizon. I have been a fan of this series since the beginning. King and Gerads have really done this spectacular job of making this a truly complete story of the duo of Mister Miracle and Big Barda. We open with some drama and sadness as Scott seems to have tried to kill himself. We then have Scott enter into a new war with Apokolips as a general, ascend to the title of Highfather, all while navigating married life, family politics, and being a new dad. Throughout the series, panels have been warped as if the original shifted in the copy machine or the signal was breaking up on an old antenna television. And while at times this has been a very sad book, there was somehow this undercurrent of hope. Even when covered in the blood of his enemies after days of nonstop combat, the love and respect Scott and Barda have for each other was a foundation for something better. The plot twists and the opening suicide and the warped panels (the biggest 'interference' happening in panels discussing death and pain) all made folks wonder just what was this story. Was it a near death experience? I myself kept saying I thought it was something like 'An Occurrence at Owl Creek Bridge', a potential future that Miracle was running through his mind in a second before he was in danger of dying. But then the end of Mister Miracle #11 happened. Spoilers ahead. December's solicits have come out and it will be a brief month with few books. DC is taking the last week of December off for new books. The holidays will keep the racks bare. That week's books will be out in January, a 5 Wednesday month to begin with. And here are the books which grabbed me! A double sized issue only 5 issues into the new run? And is the double size because of the 'anniversary' number of 25? Either way, Kara heading to the site of Krypton smacks a bit of Silver Age. 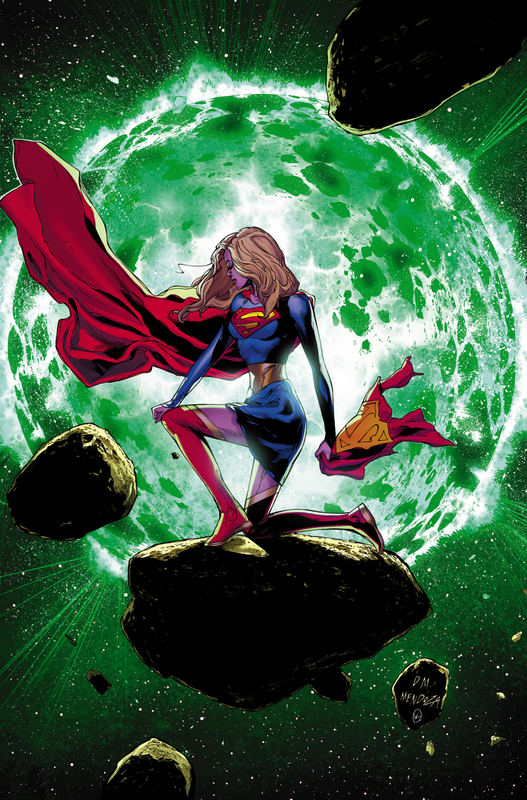 I am hoping Doug Mahnke's cover showing her cachectic because of Kryptonite poisoning. Who is Z'ndr (Xander?)? And who is the guardian at the site? A Krypto a solo story will always be appreciated. And I can't wait to see Brad Walker and Emanuela Lupacchino drawing Supergirl again. Last month we got a new direction and a soft reboot of the Supergirl title. While the numbering remained the same, we waited three months for the Bendis-izing of the super-titles to gel. Now we are back, bold and new. And since the revamp, I have been waiting for the sales numbers for August to drop. As someone who has been watching sales numbers of Supergirl books closely, I had been pretty impressed with what was happening in the latter stages of the Orlando/Houser/Rocha run book. Sales, most likely boosted by Artgerm variants, were up. Supergirl was nosing around the 31K mark. And the stories themselves were really starting to click. It was as if the creative team had found their groove, concentrating on some of the plots and letting others fade. Suffice it to say, I was very happy with the book's directions and sales were more than healthy. 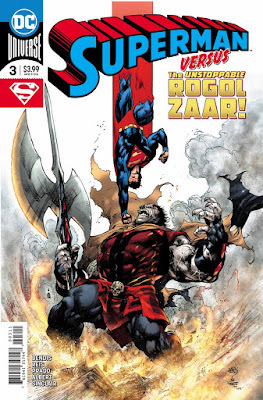 So after a couple of years living as Kara Danvers, daughter of Eliza and Jeremiah, DEO agent, CatCo intern, and student at National Tech, Supergirl decided she needed to investigate Rogol Zaar's claim that he blew up Krypton. Basically, the baby of the Orlando Rebirth book was thrown out with the bath water. Healthy sales or no, Kara was going in a new direction, one leading her away from Earth. So did it bring in new readers? One of my greatest joys in comics is scouring the bargain bins for hidden gems. Dollar boxes are abundant here and whenever I thumb through, I feel like some old miner, panning for gold and hoping to strike it rich. Now usually I am looking for things from the 70s and 80s in those bins but more recently, I have discovered a new passion. I like finding books from the 90s and 00s which maybe I should have bought but didn't. And any over-sized or Prestige format book found there is most likely going to get bought. 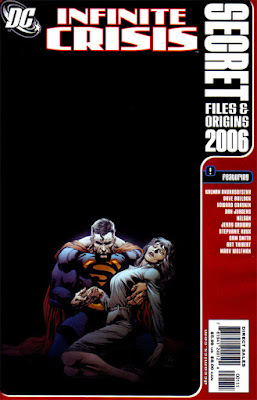 In particular, I have found a new love for the DC Secret Files and Origins series. These books usually have a couple of stories. They exist to fill in readers to a current character's history and ongoing stories. And they always have some version of 'Who's Who' style pages. It has reached a point that, if in the $1 box, even for characters or arcs I don't like, I'll probably get the Secret Files and Origins. Which brings me to Infinite Crisis Secret Files and Origins 2006. To be frank, I don't really remember this Crisis too well. I remember Alexander Luthor and Superboy Prime escaping paradise and doling out 'reality punches' to shake up the universe. I think Luthor even makes 'tuning forks' like the Monitor. And, of course, Superman from Earth-2, the first hero and the ultimate hero in Crisis on Infinite Earths, was made a patsy. I also remember a hodge-podge of artists filling in pages in the latter issues. But the ending? I don't recall. So this falls into one of those 'don't like the arc but maybe I'll like this Secret Files' sort of issue. And, as usual, I did. A few key moments will be shared! I have been pretty pleased with the recent Justice League comic, written by Scott Snyder with art from Jorge Jimenez and Jim Cheung. It is an often confusing, universe shaking, wildly imaginative story that often leaves me perplexed and breathless. 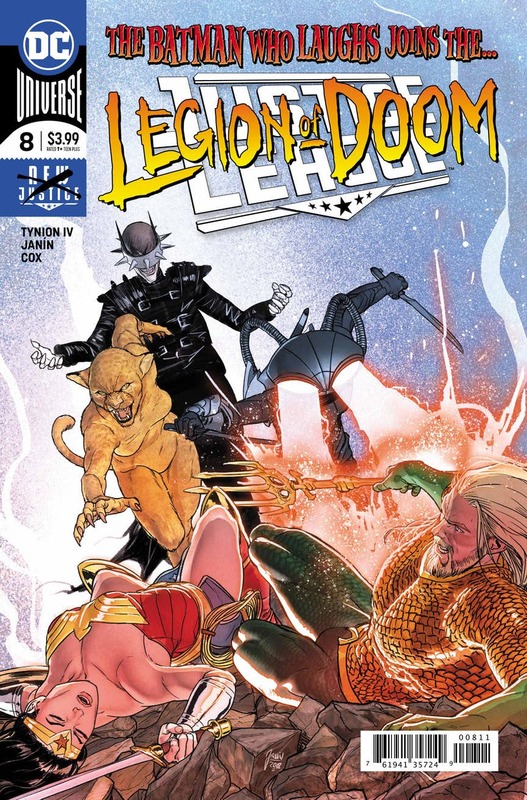 What has been interesting is the plan to intermittently have an issue be dubbed Legion of Doom, written by James Tynion IV, and focusing on a villain. It is a chance to take a breath, slow down, and see life from the other side of the fence. Justice League #8 is mostly about Lex Luthor, the leader of the villains and the one most in the spotlight for the earlier arcs and his conversation with The Batman Who Laughs. We get some of the League. We get some of the other LOD. But mostly it is these two talking in half-truths, each trying to be the smartest guy in the room. Thankfully, there is some plot progression at the end. This was my least favorite issue of the run. It is probably because I didn't read Metal and have no idea who this Batman Who Laughs is. Tynion does a good job of painting the picture that he is exceedingly powerful and dangerous. But he is basically an unknown to me. So his talk with Luthor didn't carry the punch I think it would for others more informed. That said, Mikel Janin is on art and is wonderful. His art is slick and gratifying. Everything kind of has a sheen to it, detailed and expressive. This title is one of the prettiest on the stands. And, as I said, more clues get added to the mix. My youngest Supergirl is 14 but still heads to McDonald's now and then, usually to hang out with friends. And it seems the only things on the menu that she herself will eat are fries and McFlurries. That said, her friends still occasionally enjoy McNuggets or other treats there. Where is this all going Anj? Well, my daughter came home and said that she had gone to McDonald's with her friends. 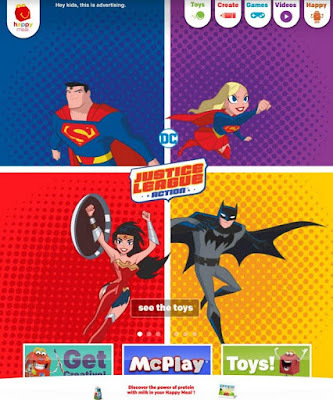 Her friends got Happy Meals complete with Justice League Action toys! And when the friends were going to throw out the toys, my daughter said, without shame, 'I bet my Dad would love this.' And she brought it home for me! 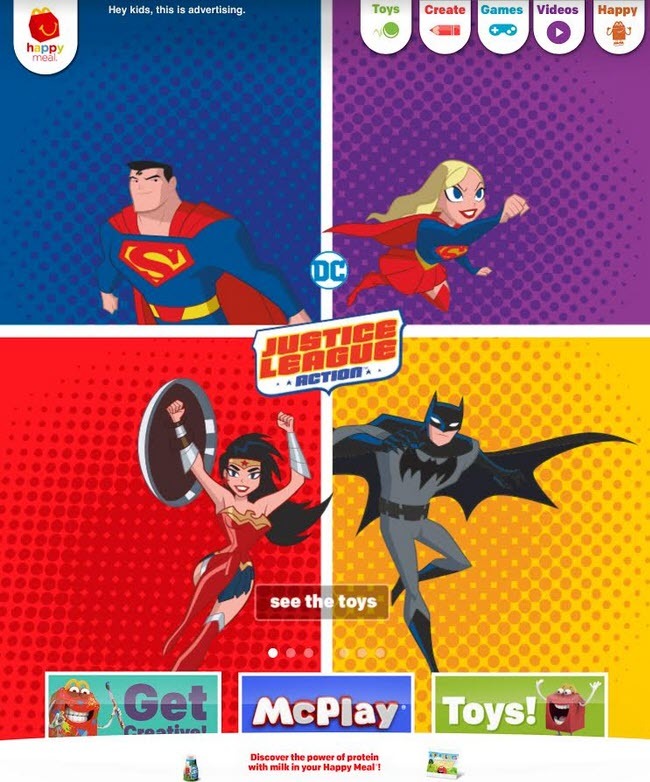 As for McDonald's, if you head to their Happy Meal website now, you'll be greeted by the Justice League Action opening page. There is Supergirl, right up there with the Trinity! Amazing. That could have been Flash or Green Lantern. It could have been Stargirl or a villain. I am still floored by things like this. She is that much in the public consciousness. On to the actual toy! A couple of weeks back I got the best surprise in the mail. Darrin and Ruth Sutherland, of the R a D Adventures podcasts, sent me the Ron Randall commission above. Darrin and Ruth are found on Twitter at @RaD-Adventures and podcast at Trekker Talk, Warlord Worlds, Xenozoic Xenophiles, and other shows. They are just the nicest people on the internet, great friends and so generous. I've always been a fan of Randall's art and held out hope I'd run into him at a local con so I could get a sketch. So imagine my surprise to find the package on my doorstep which had this inside. 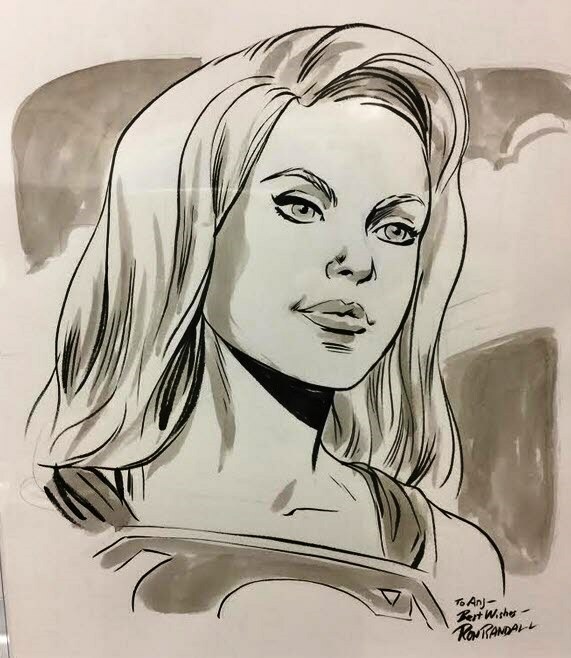 This is ust a lovely take on Supergirl. She looks so young and happy, almost pensive. I can't thank Darrin, Ruth, and Ron enough for this great gift, a truly wonderful addition to my collection! 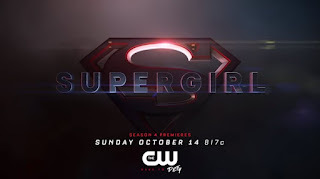 It was only a month ago that news of a possible Supergirl movie hit the internet. Of course, there wasn't much there other than news of a screen writer. But the idea that Warner Brothers might want to re-energize the Super-franchise by moving away from the doldrums of the Snyder-verse seemed to make sense. With the success of Wonder Woman and impending success of Captain Marvel, it just seems like a no brainer. But now some new rumors have come out in the aftermath of the announcement that Henry Cavill will no longer play Superman. It is unclear that the Cavill rumor is true. So these new Supergirl movie rumors are worth discussing here, even if (as the first rumors) this is an exceedingly premature conversation. A source today, right after today’s news broke, echoed the same sentiment that Warner Bros would shift focus to "Supergirl" and that movie—likely a period piece set in the 1970s (though this could change) with the young Kryptonian as a teenager—would knock Cavill out of the running for appearing in that particular time period (he’d still be a child then). So, the actor could stick around, but if Supergirl were to go first and with no “Man of Steel 2” film in development, it’s very conceivable that Cavill could not turn up as Superman again for several, several years hence everyone kind of walking away for now, but keeping the door open. Now I must admit that I don't know if I am keen on Supergirl being set in the 70s, especially if it is part of the DCEU continuity. If Kara did reveal herself back then, wouldn't the S-symbol be known. Wouldn't Superman's reveal be less profound? 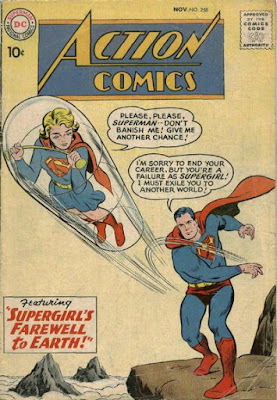 If she were alive, wouldn't she come to aid Kal when the Phantom Zone folks arrived? Or does that mean she's dead in the present? Honestly, there is nothing wrong with her arriving after him. Or having arrived earlier but having been in suspended animation or something to explain her youth. Isn't that what the Man of Steel open pod supposed to be all about? All that said, the idea of a 'Daring New Adventures of Supergirl' style movie is intriguing if only to see Linda Danvers in all those clothes we saw in that comic. And then the rumor about the villain! Superman #3 came out this week and was my favorite Brian Michael Bendis penned issue of this title. I have been enjoying Action Comics a bit more than Superman because Bendis seems to have a great grasp of who Superman is, what he means, what he would say, and how people would react to him. Action Comics is mostly Metropolis based plot with street level crime and lots of Daily Planet scenes. So that works. Up to know Superman has been the more Super and less Man of the books. The opening story has the entirety of Earth sent into the Phantom Zone where Rogol Zaar has been exiled. I haven't warmed up to Zaar as a villain yet. The new take on the Zone as a Hellish physical realm is still one I am wrapping my head around. So this arc hasn't exactly grabbed me. This issue does move the plot along pretty nicely. We learn why all this is happening. We see Zaar scheming from the zone. But most importantly, we see how Superman is leading in this crisis. And we see the profound effect he has on people. We also get a look inside his head to see his thoughts when all this is unraveling. We get an oddly moving moment with a classic DC villain. This was a character issue. And that made me happy. Add to that the gorgeous art by Ivan Reis and Joe Prado and this issue is a winner. Reis and Prado have the tough task of drawing Earth-side calamities as well as massive space fights in the deeper Zone. There stuff is wonderfully detailed and just gorgeous. I hope their run on the book is long. 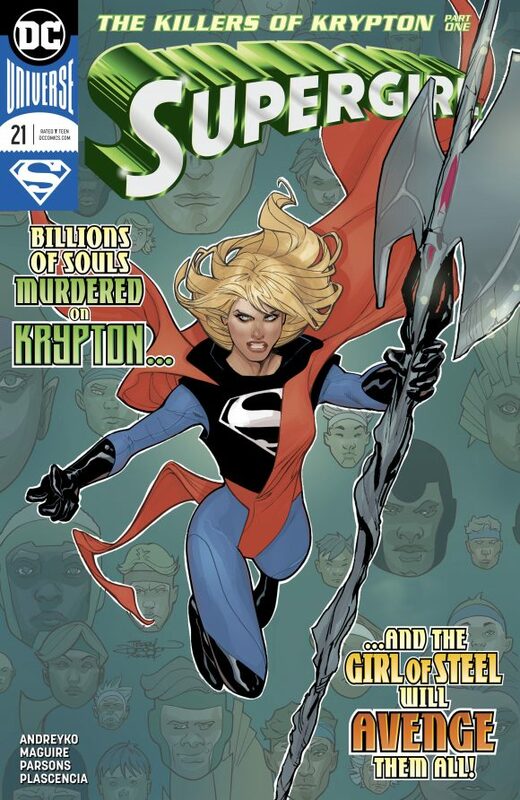 Supergirl #22 came out this week, the second chapter in the Marc Andreyko era, and a decent move forward in the storyline of Kara's space investigation of Krypton's destruction. I was heading into this new time with some trepidation. Steve Orlando and Jody Houser had really got their sea legs and were crafting great stories in this title just to have the Bendis-izing of the super-titles rock the boat. Plus, images of an axe-wielding Supergirl being portrayed as an enemy of the Green Lantern Corps seemed like a step backwards. This second chapter does push the overall storyline forward nicely. We get a lot of internal monologue here which does a good job of telling us just what Kara is feeling here. I have a better sense now of why she is so hell-bent on this mission. There is a nod back to the Silver Age which made me smile. And Kevin Maguire hits another home run on art here, giving us every bit of expressive emotion he can in the art. And there is no doubt this book is linked to the ongoing Superman books. Overall, I liked this issue. Not to say it wasn't perfect. I don't quite understand why Supergirl is being so secretive about her mission. She seems a bit all over the map here emotionally, more than I would expect from someone who has lived the New 52 life she has. I don't want all those lessons to simply be swept under the rug. No matter how much we believe in ourselves it never really goes away. But once we catch ourselves, we have to jump right back out there. As the trailer plays out, it becomes clear that this is Kara talking to Nia Nal in CatCo. Is this a plot about Nia being transgender and afraid by opening up? But this plays into Kara's character as well. We have seen her be overconfident on the show in the past. So she comes to this moment of mentoring honestly. On to some screen shots! 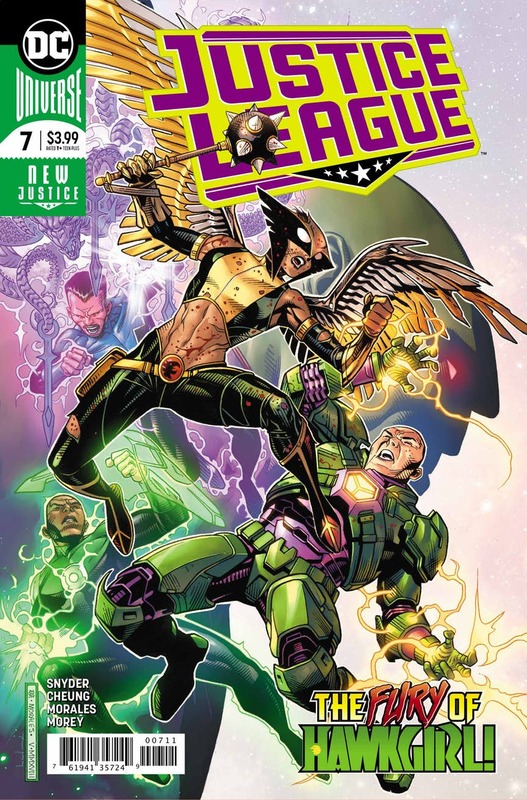 Justice League #7 came out last week, the conclusion of 'The Totality' arc. As has been the case with this title, there is a lot of action and a lot of big comic book ideas that rapidly fly by. It has been almost dizzying in execution and definitely confusing in some places. I feel I really have been flying by the seat of my pants here. But 7 issues in, I actually wouldn't mind a little exposition now. I think Grant Morrison and his books. A lot of big ideas came and went in his books. But often, they were in the background or were minor details to the plot. I could roll with them because Morrison often times built a foundation for the main storyline that was solid. Here? Those crazy ideas are the main plot. Now that isn't to say I haven't liked this title. It is bonkers and sometimes I need that in my comic runs. And the art, this issue by Jim Cheung, is gorgeous. But if the next plot hinges on the ending of this Totality arc, I can only hope that we get some more solid background. A shaky foundation helps no one. 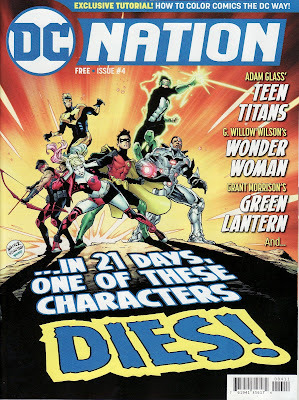 I have said before how much I love the DC Nation free magazine. Every month we get company propaganda but also a lot of interviews, process pieces, creative thinking, and Direct Currents. For someone like me, who likes the behind the scenes stuff as well as the actual finished products, this book is a godsend. 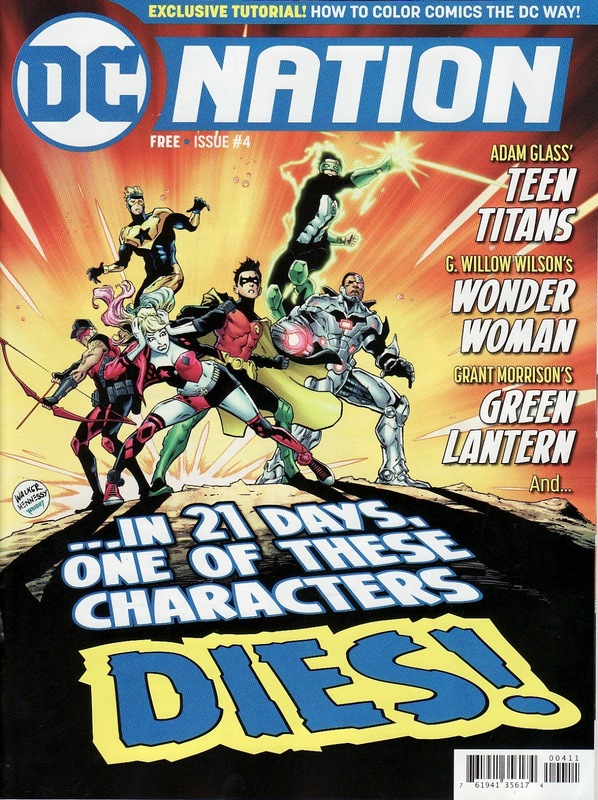 And DC Nation #4 continued the trend. I mean, I am stoked about the upcoming Grant Morrison Green Lantern book. So getting to read an interview with him and Liam Sharp is fan-tastic. Not that all the news is good news. This issue has 'real' psychoanalysis of the DC Trinity and the reports read pretty rough. The Superman one in particular makes him sound depressed. That isn't my Superman. But we are here to light a candle, not curse the darkness. So what stuff relevant to this site grabbed me? There is an article about the foil covers coming out in October. It reminds me of the 'Chromium Age' of enhanced covers in the madcap speculator 90s. Jim Lee has seen all the covers and picks out his favorites. No surprise but the Artgerm variant on Supergirl #23 is on that short list. Unlike some of Artgerm's covers, this really looks like a young girl Kara. Even her pose strikes me like a kid being told to vogue a bit. I love it. Lee is able to put into words what I feel from Artgerm's covers. There is a vitality in the heroes that just seeps from the page. 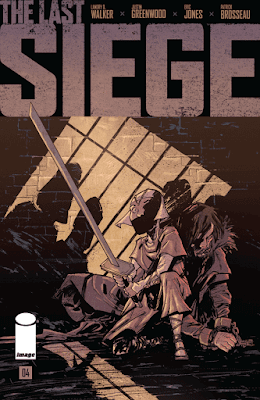 The Last Siege #4 came out last week and once again it was one of the most cinematic books that I have read recently. Everything about this title screams film to me. From my description of this as spaghetti western meets Braveheart, to the way the panels flow almost like storyboards, this comic plays out in my mind while I am reading it like a movie. And that is high praise. Because comics are all about filling in the gutters, about intuiting what happens between panels. When a book flows the way this one does, it is magical. To put it in even stronger terms, I am starting to hear a score in my mind when I am reading this, from percussion beats as our hero is kicking down a door to frenetic strings as our Queen is running on rooftops dodging arrows. 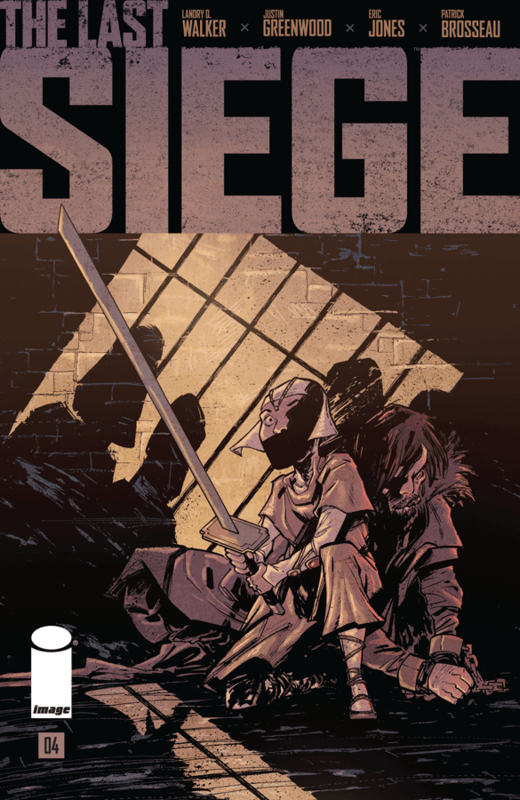 Writer Landry Walker continues to slowly unwind this story of a single castle holding off the hordes of a warlord conqueror. But that external threat still hasn't manifested. Instead we have been shown the internal conflict within the walls of those who are willing to fall in line with the current regime even if it means losing their souls and those holding on to their integrity and identity. It all unfolds in the midst of brutal scenes of violence which makes it all the more glorious. The art team consists of penciler Justin Greenwood, colorist Eric Jones and letterer Pat Brousseau. They bring a muddy and murky feel to everything here, creating the perfect tone for this dark play. Even when blood is shed, it is more of a black ink than a shock of red. It complements the writing perfectly. This is the halfway point and it feels as though we have hit the apogee. Our queen has finally talked both in word and in deed. No turning back now. The reappearance of an older, scarred Jon Kent still hasn't happened in Brian Michael Bendis' Superman books and I am thankful for that. Because it means I get to enjoy the more playful and fun-loving Jon Kent from the Super Sons book. 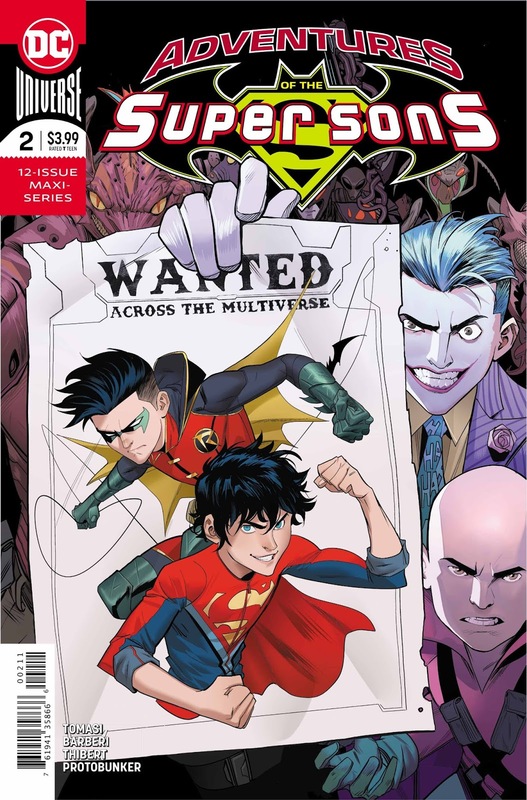 Adventures of the Super Sons #2 came out this week and continued this fun romp through the DCU. Writer Peter Tomasi has shepherded Jon and Damian through their adventures together and I think he probably realizes the writing is on the wall that Jon and Damian will never be these kids again. So why not write a crazy story and borrow from DC's crazier history at the same time. This is a ton of fun, a sort of roller coaster ride where things happen fast as you careen into plot turns. Carlo Barberi and Art Thibert are the perfect pair to provide art on the book, bringing a kinetic and somewhat cartoony feel to the proceedings, amping up that crazy factor a lot. The action especially leaps off the page in a four color wonderful way. But the main thing is that this is a fun book. I find myself grinning as I read it, a reminder of all that Rebirth was supposed to do. It seems recently that DC wants to undo a lot of that, as if they hate the prosperity it brought them. So savor this while you can. 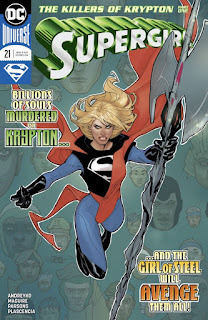 Every so often I think back to the days when I first started this blog with intention of showcasing my favorite character Supergirl, a character I felt had been completely overlooked and at times mistreated. The times have changed over those 10 years haven't they. Successful live action television show. Successful animated programs. Successful toy lines. Even successful comic titles. Marc Andreyko has sent Supergirl into space with Krypto to investigate Rogol Zaar. Here at the site, I am continuing my unofficial and somewhat random look at adventures with Supergirl in space. And what better issue to look at than Action Comics #258, Supergirl's first adventure in space and the story where she first met Krypto! I strive to have these back issue reviews have some bearing on current arcs. So this seemed perfect. This story also plays into the Silver Age theme of Supergirl being extremely worried of letting Superman down and kowtowing to his various demands and rules. It also shows Superman to be a rather nasty individual, putting Kara through the wringer for reasons that don't warrant such harsh treatment. Supergirl was truly cringing in his shadow back then. Remember, we are only 6 issues into her very existence. Once again the creative team here is the legendary team of writer Otto Binder and artist Jim Mooney. And it pushes the Supergirl narrative forward a fair bit, not only with this ongoing theme of needing to prove to Kal that he can trust her but also by introducing her to more of the Superman universe. I wish I owned the issue itself. 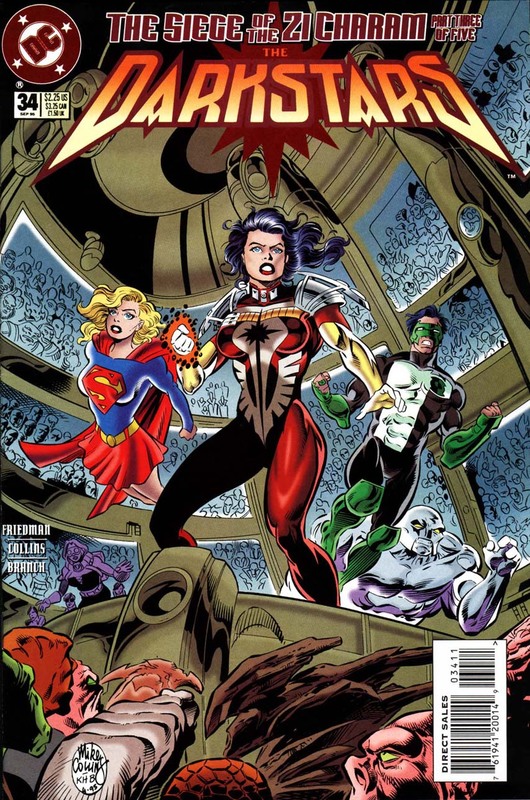 Scans come from the Supergirl Archives, volume 1. Last week I began my review of my excellent time at TerrifiCon. As I said then, this convention has become the high point of my convention season. There were just too many great creators there to try and meet and chat with. I already talked about how great the venue was, how accommodating and friendly the creators were, and how it was comic book centric, so rare these days. So let's jump into more of my fondest memories! If you remember from my TerrifiCon prep post, Kevin Nowlan and Ron Frenz were the two commissions I was hoping to score here. Last week I talked about how lucky I was to grab the Nowlan sketch. So did I go two for two? Based on the title of this post, you can probably guess. 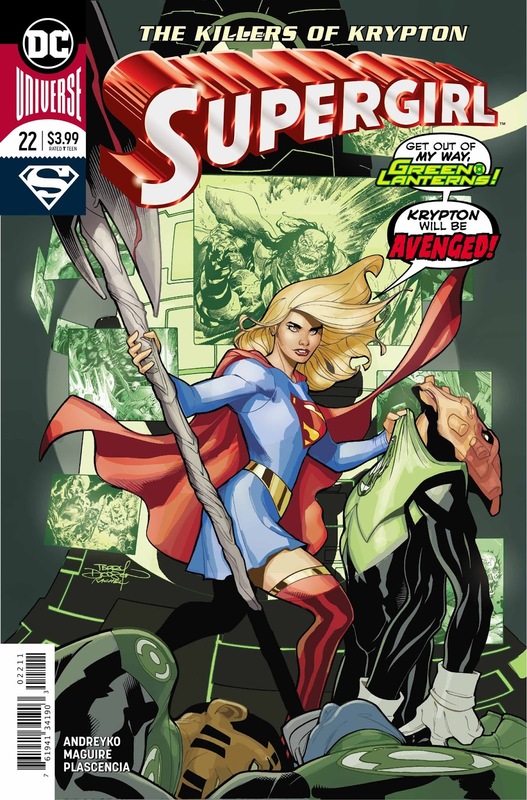 In her own title, Supergirl is heading into space to investigate Rogol Zaar. Here at Comic Box Commentary, I have been informally reviewing past stories of Supergirl heading into space. Last month I reviewed Green Lantern #65, the second part of the crossover storyline The Siege of Zi Charam. As luck would have it, I also have Darkstars #34, the middle chapter of the same arc. 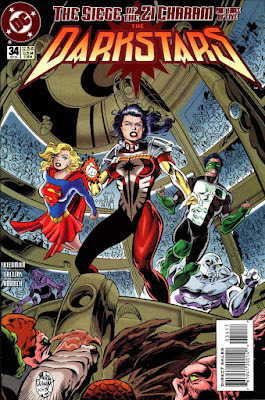 While Supergirl doesn't have much to do here, she is part of the Titans/Darkstar team-up trying to stop the Progenitors from overwhelming another system. For good or ill, these are the only two chapters I have of this arc. 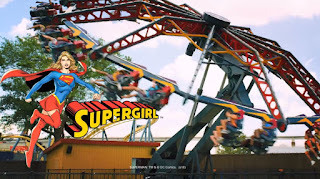 My sense we get much more Supergirl-centric action in chapter four. I also have heard from people who have read the whole story that I am not missing much. I always am looking though. Writer Jan Michael Friedman and artist Mike Collins accomplish just what a middle chapter should do. They push the story forward, filling in some information with exposition, throwing in some action to keep people engaged, and setting up the finale. Friedman tries to include some character moments but the bulk of the story is told by aliens enmeshed in the action rather than the team. I buy this book for the Darkstars and these guest stars, not to see three alien races I know nothing about debate what to do. And pages are devoted to the other subplots within this title; I suppose for those collecting the title, this should happen. Mike Collins art is cartoonish in places. It is muddy in others. In particular, his alien races are rather bland and flat. But Supergirl is in space and she is trying to solve problems. So off we go.